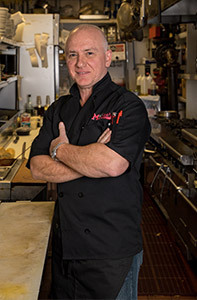 Alfonso Molino, the owner of Molino’s Italian Kitchen, was born in Brooklyn in a neighborhood rich with the Italian-American culture and values. At the age of 7, Alfonso’s parents opened up a small Pizzeria there, and shortly after (at the age of 10 after school) he began to make pizzas in the family owned business, marveling customers with his culinary skills at such an early age. When his parents separated, Alfonso began working in many pizza parlors throughout the city to help out with the family’s struggling finances. Almost every day after school hours, he would go straight to work until late in the night. After graduating, he decided to open his first place in upstate New York, quickly establishing himself as a true Italian chef. From there he moved on to open several successful places in Florida, with one in particular named after him: Alfonso’s Italian Restaurant in the beautiful coastal town of Stuart. There is an inexplicable draw within most of us to return to the place where we were born and raised, so missing his roots, Alfonso returned to New York. Wanting to try other professions outside of his roots in the family owned business, Alfonso began working on Wall Street but ended up disliking the sterility of such a business. That’s when he joined the food wholesale business, working for two of the largest food distributors in the country targeting dozens of the city’s restaurants and pizzerias. He excelled, gained experience and decided to get back in (or as he says, it “sucked me back in”) after getting married in 2002. One day, while driving in New Jersey, he found an Italian restaurant named Romeo’s for sale in the Yorktowne shopping center in Manalapan NJ. Seeing the location potential and with the moral support of his wife, he decided to buy it, turning it into Molinos Manalapan NJ. So much more than the renowned Italian chef and restaurateur he has become, Alfonso is a big believer in giving back. With the success of his Italian restaurant, he is an avid supporter of various community groups and sports teams, and always eager to helping other’s to thrive. Stop by Molino’s Italian Kitchen today at 300 Gordons Corner Road and discover the pizza place that so many people have come to love.